Born and raised in Staten Island, John G. Hall has been a practicing attorney since 1961, with a focus on banking, real estate, estate planning, and real estate and estate litigation. He first joined the practice in 1965, when it was known as Fach & Sipp. In 1969, Mr. Hall was made partner and the firm changed its name to Fach, Sipp & Hall. In 1974, with the departure of Mr. Sipp, the practice became the Law Firm of John G. Hall and in 1992, Thomas J. Hall became a partner and the practice assumed its present name of The Law Firm of Hall & Hall, LLP. Prior to its merger with Independence Community Bank, the firm represented SI Bank & Trust (formerly Staten Island Savings Bank), a $7 billion thrift which as a result of successive mergers is now part of Santander Bank, for which the firm still handles commercial and residential closings. For more than three decades, Mr. Hall was the primary attorney and senior partner in the firm’s role as general counsel to SI Bank & Trust. In this role, he has handled a myriad of matters involving diverse issues in the fields of banking, lending, corporate governance, commercial leasing, regulatory matters, foreclosures, and other commercial and bank litigation. Mr. Hall is admitted to practice law in all courts of the States of New York and New Jersey, the U.S. District Court for the Eastern and Southern Districts of New York, the district of New Jersey, the U.S. Court of Appeals for the Second Circuit, and the U.S. Supreme Court. He is the former president of the Richmond County Bar Association and the former chair of the Real Property Section of the New York State Bar Association. In 2006, he received the Professionalism Award from the New York State Bar Association Real Property Law Section. Mr. Hall has authored several articles on real estate matters that have appeared in publications including the New York Law Journal, New York Real Property Law Journal, and the Real Estate Finance Journal. He has also co-authored book chapters on mortgage foreclosures and surveys for the New York State Bar Association. In addition, Mr. Hall has often been consulted and quoted by New York Times Real Estate Q&A section. Mr. Hall has been a speaker on various real estate topics and other legal topics for Bar Associations and student groups. 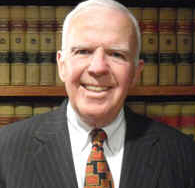 He has appeared as a speaker for the Real Property Law Section of the New York State Bar Association over 25 times. He has spoken before the Richmond County Bar Association, Brooklyn Bar Association, Queens County Bar Association, Association of the Bar of the City of New York, Nassau County Bar Association, Suffolk County Bar Association, Westchester County Bar Association, and Schenectady County Bar Association. He has also served as legislative counsel in the New York State Senate and testified as an expert witness in real estate litigation concerning title and closing issues including RESPA, Truth in Lending, ECOA, and secondary market transactions. Mr. Hall received a Bachelor of Science degree in accounting from Villanova University and earned his Bachelor of Laws (now the Juris Doctor degree) from Villanova Law School, where he was the managing editor of the Villanova Law Review and was a finalist in the Reimel Moot Court competition. Mr. Hall earned his Master of Laws degree from Brooklyn Law School.